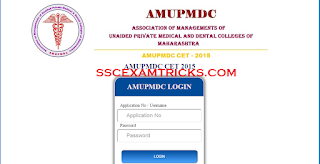 The Association of Management of Unaided Private Medical and Dental Colleges (AMUMDC), Maharashtra has released online admit cards on official website for Asso Combined Entrance Test (CET) which is going to be held on 17th May 2015 for getting admission in Under Graduate Courses i.e. for admission to Nursing (B.Sc), Dental (BDS), Medical (MBBS), Ayurvedic (BAMS) & Physiotherapy (B.P.TH.) Degree Programs. 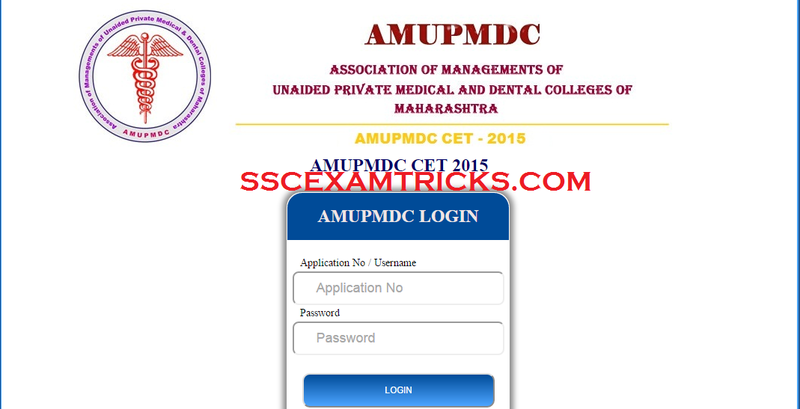 Earlier AMUMDC had invited application from 23/03/2015 to 25/04/2015 for this entrance Examination. A huge numbers of candidates had applied for this entrance examination and waiting for online admit cards. Candidates can download their admit cards from the direct link provided below. Read the instruction provided at the bottom of the admit card. Admit card is an entry card to appear in examination. It is a mandatory document valid with photo identity proof specially Voter Card ID, PAN Card ID. Ration card and Adhar Card are considered as photo identity proof to check the candidature of any candidate. Candidates are advised that they don’t forget to bring their admit card along with photo identity proof to the examination centres. It is also advised to the candidates that they will reach to the venue of examination 20-30 minutes before the examination time. Late coming candidates will also be not allowed to appear in the examination hall. · Enter Application No or User Name and Password. · Save and print Admit Cards Hard Copy for the Exam. 5. Note down Seat No., Floor of the back side of the Admit Card page. The Final Admission of the candidates will be based on merit List on the basis of Performance in written examination. The Written Exam will be conducted on 17th May 2015 from 02:00 PM to 05:00 PM by Pen MODE. The medium of examination shall be English Only. The syllabus will contain topics of Physics, Chemistry, Biology, Zoology. The exam will be a multiple choice question paper in which four options will be provided out of which candidates need to choose one correct answer. The Asso-CET 2015 will consist of one common question paper in the subjects of Physics, Chemistry and Biology (Botany & Zoology) consisting of 200 Multiple Choice Question (MCQs) 50 in Physics, 50 in Chemistry & 100 in Biology. The candidate is expected to attempt all the 200 questions. Out of four circles provided for selection of answer against a question, the candidate should fill-up one circle of right choice with black ball pen only. Each correct answer will be given one mark. There shall be no negative marking for wrong answers. Scratching, overwriting, tick marks, erasers, whiteners & multiple answers will be considered as wrong answers and no marks will be awarded to them. Use of pencil is prohibited.The time duration for Exam will be 3 hours i.e. 180 minutes. List of Colleges and their Code Numbers will be displayed on website from 5th June 2015.